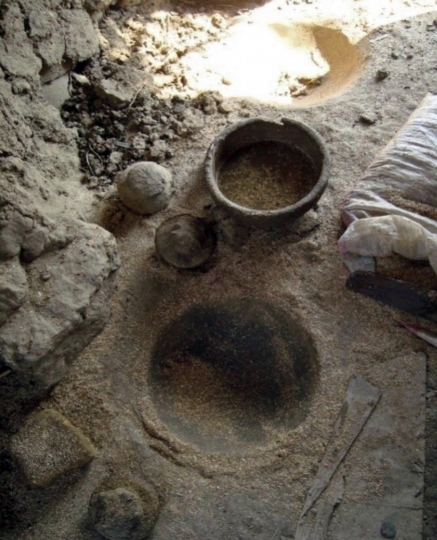 CAIRO — Archaeologists in Egypt have discovered an ancient pottery manufacturing workshop dating to more than 4,000 years ago in the southern province of Aswan, the Antiquities Ministry said Thursday. The workshop, the oldest pottery workshop in the Old Kingdom, belongs to the 4th Dynasty, spanning 2,613 to 2,494 B.C., the ministry said in a statement. The Old Kingdom is also known as the age when pyramid-building flourished. Inside the workshop, archaeologists found an ancient pottery manufacturing wheel made of a limestone turntable and a hollow base. Mostafa al-Waziri, secretary general of the Supreme Council of Antiquities, says the discovery is "rare" and reveals more about the development of pottery manufacturing and the daily lives of ancient Egyptians during that time in history. Also on Thursday, archaeologists opened a large, sealed, black granite sarcophagus dating to some 2,000 years ago in the coastal city of Alexandria. The discovery, announced earlier this month, triggered speculation in local and international media about its contents. However, Al-Waziri told reporters that only skeletal remains and sewage water were found in the sarcophagus, quashing speculation that it belonged to some ancient ruler. He said the sarcophagus, weighting some 30 tons, may have belonged to a wealthy family that lived during the Ptolemaic era. Later, the Antiquities Ministry said in a statement that initial inspection suggests the the skeletal remains likely belonged to three warriors. It said the remains will undergo restoration to reveal more about them. Egypt has gone to great length to revive its vital tourism industry, still reeling from the political turmoil that followed a 2011 popular uprising. In recent years, the Antiquities Ministry has touted discoveries in the hopes of bolstering tourism, a major pillar of foreign currency.